Are you looking for a new experience, or have you done any of these before? Whether you’re looking for fun things to do or a new life-long hobby, all these winter adventures can bring huge satisfaction. It doesn’t matter what previous experiences you have had, or if you haven’t even seen snow before, because with these activities you can get all the equipment and support you need from qualified instructors if you arrange your activities through https://www.chateaubeauvallon.com. There’s a whole winter wonderland waiting to be explored; however, at the end of the day, when you are very nearly exhausted from a day of activities in the ice and the snow, and when you’ve stretched yourself as far as you can go – the important thing is to come back to a warm room with a roaring fire, speedy room service, and, if you can still make the journey downstairs after the day you’ve had, a comprehensive bar waiting for you. Tubing is simply fun. You don’t need to spend years perfecting your technique – you sit in a huge innertube at the top of a slope, and let gravity do the work. This will be familiar if you’ve ever been sledding, but because of the low friction of the innertubes on the snow you’ll find yourself going much faster. When you reach the bottom, rather than pulling your equipment back up to the top of the slope, you can sit back as the mechanical lift prepares you for the next run. You can rest assured this is appropriate for little ones too, since the activity is supervised and the slopes are lined with protective barriers. This is a great activity for all the family, and there’s no end to the enjoyment you can have on the slopes. Are you a dog-lover? 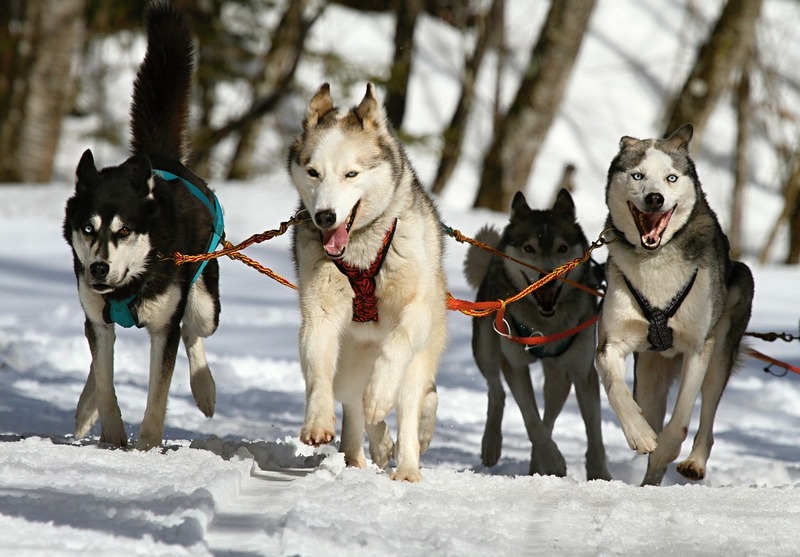 You can take a tour and enjoy racing through the snow, pulled by handsome and intelligent huskies and other sledding breeds, or you can learn to drive the pack yourself. This can be an incredibly rewarding experience, as you learn how to get the pack to respond to your directions. With snowmobiles being utilized for most of the work, dog sledding is becoming an increasingly popular leisure pursuit. Although, if you’d rather see the professionals at work, you can watch as a spectator at one of the races. You may be a hardened rock climber, or maybe you’re just always willing to try new experiences, or perhaps you have teenagers who’re always looking to do something exhilarating. Rather than wearing out your hands on stone handholds, or feeling your grip slip on plastic, you can climb a vertical face of solid ice by digging your icepick only a centimeter deep into the ice. As you raise yourself over the tough terrain you can’t fail to have an intensely rewarding time. You can begin on a small, artificial face, and you can progress to levels you previously wouldn’t have believed. You've got to go where the snow is! I've lived in snow for 17 years now & I still haven't done anything except attempt to snowboard once and tobagganing (which was super fun). Snow tubing looks fun though. Thanks for stopping by Jo-Anne.